Bank Nifty opened lower at 24771, decline further after opening by more than 400 points to register day’s low 24353 and finally closed 396 points down at 24421. Friday, 24860 was immediate breakeven point on upside. Bank Nifty was expected to bounce further towards 25127-25356 if breaks and manage to trade above 24860 continually for 15 minute. 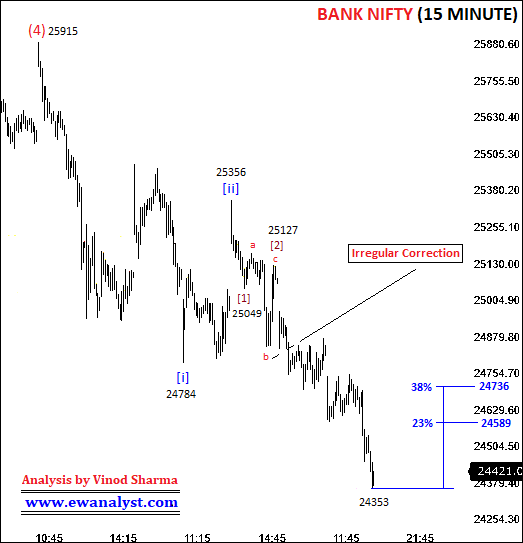 Otherwise, Bank Nifty if fails to break above 24860 was expected to fall further towards 24696-24240. Trading strategy was to buy any suitable call of 01 Nov expiry [which is trading around 60] near 24860 if Bank Nifty breaks and trades above 24860 continuously for 15 minutes using stoploss of 27 expecting bounce towards 25127-25356 in coming days. But Bank Nifty opened at 24771 and declined further till 24353, so our trade was not activated. Now, we need to analyze fresh charts to calculate further move. This is Hourly time bar chart of Bank Nifty covering move from all time high 28388 which I am expecting start of wave  of wave (iii). It seems wave completed from 28388-26555 may be wave (1), wave completed from 26555-27205 may be wave (2), wave completed from 27205-24240 may be wave (3), wave completed from 24240-25915 may be wave (4) and wave (5) may be in progress from 25915. Minimum 38%-61% projection for wave (5) is placed at 24330-23351 but earlier low is 24240. So, 24240-23351 is the minimum expected target range for completion of wave (5) if wave completed at 25915 is really wave (4). So, let’s analyze wave (5) started from high 25915 on separate lowest time frame chart to check its pattern/immediate counts. This is 15 Minute time bar chart of Bank Nifty covering move from high 25915 which I am expecting start of wave (5) on the previous chart. It seems wave completed at 24784 may be wave [i], wave completed at 25356 may be wave [ii] and wave [iii] may be completed at 243523 or still in progress. 23%-38% retracement of progress of wave [iii] is placed at 24589-24736 which is immediate resistance range on upside and 24736 is the breakeven point on upside and stolposs for any shorts. Bank Nifty is expected to decline below 24240 towards 24240-23352 in coming days with 24589-24736 as immediate resistance on upside and 24736 as immediate breakeven point. So, Bank Nifty is expected to decline towards 24240-23351 without breaking above 24736. 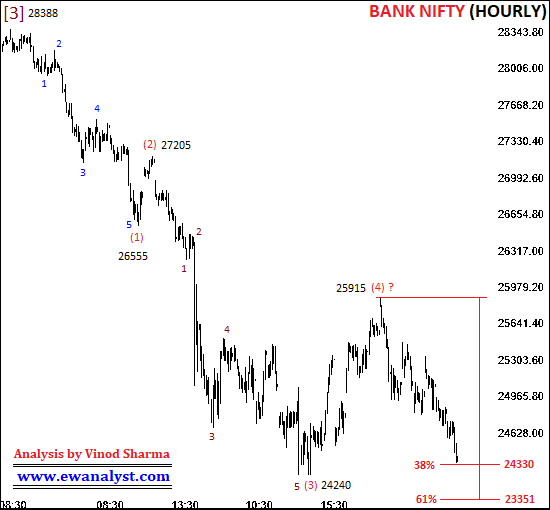 But Bank Nifty if manage to break and stay above 24736 can bounce further towards 25127-25356. We need to keep all these conditions in mind while deciding next trade. Again, Bank Nifty is very Volatile, Implied volatility is very high and options are expensive. Options premium may not rise even on 200-300, so trading in options is rewarding only if we see one sided move of 400-500 points. We must keep in this mind while deciding next trade. 1. Bank Nifty if bounces towards 24589-24736 range then any suitable Put of 01 Nov Expiry (which is trading around 60) can be bought in 24589-24736 range using stoploss of 27 expecting decline towards 24240-23351. 2. But, Bank Nifty if manage to trade and stay above 24736 for 15 minutes then any suitable Call of 01 Nov Expiry (which is trading around 60) can be bought near 24736 using stoploss of 27 expecting bounce towards 25127-25356. Trade must be initiated after 9:30 AM only (15 minutes after opening). Be quick in booking profits because Option premium is expensive and volatility is high. Disclaimer: This analysis report is just for outlook, probabilities and expected markets behaviour based on my personal Elliott Wave Analysis. Any trade based on these reports is solely your decision. I will not be responsible for any trade, loss or profit.